The After Effects’ disk cache system is something I really appreciate when working with large complex projects. Although most of the magic is done behind the scenes, it still plays a critical role in the After Effects workflow, saving a ton of previewing and rendering times. When I think of the word cache, as some of you 3D guys may know, I think of a ton of large files set aside somewhere. When doing 3D simulations such as smoke or liquid simulations, you’re working with caches all the time so it’s kind of hard to forget about them. Since After Effects does caching in the background, I find that a lot of users sometimes forget that things are piling up behind the scenes. Essentially, when you process and render frames (such as with a RAM preview), After Effects will try to save those frames and information onto your disk. That way, After Effects will be able to call and re-use that information if it needs to a lot faster. So if you make changes and want to revert back to your original changes, After Effects won’t have to re-calculate everything, it can just re-use the info from the cache. If you’re using AE CS6+, you’ll have global performance cache and persistent disk cache that will intelligently help you save more time in your renders. As I said before, sometimes these caches get really large without us realizing it. 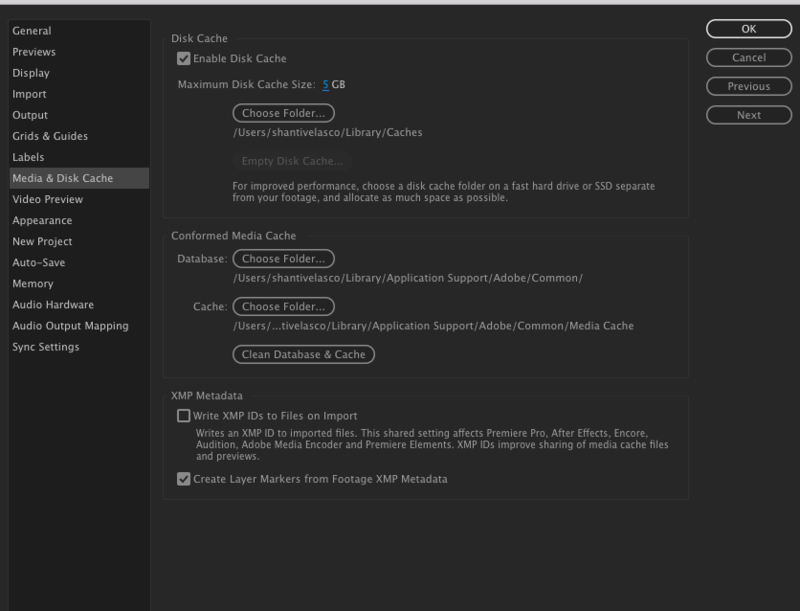 To clean your disk cache, head over to your After Effects Preferences, go to Media & Disk Cache, then hit Empty Disk Cache. A few people reported that this didn’t necessarily delete the files off their drives, and this could be for a multitude of reasons such as whether you’re still using the cache files or not, etc. You can also manually clean your cache by going to the folder and simply deleting the files. Believe it or not, some people have disk cache folders that are 100GB+, some which they may not even need anymore. Since there currently isn’t a way to automatically clean caches (for good reasons), you’ll have to do it yourself. Some tips on cache drives: Make sure you use a fast drive such as an SSD with a lot of storage space. If possible, use a drive that is separate from where your footages are to take advantage of the throughput of the drives. The faster the drive, the faster AE can write to those drives. If you’re tight on space, try lowering the Maximum Disk Cache Size to an appropriate amount. So how much space did you save on your drive by cleaning your caches? Let me know down below! If this article helped you out, feel free to share it with others. Nice! How much storage do you have on that drive? SSD? Glad to hear you cleared a lot of space! 589GB is quite a lot of cache files haha. Lol, I learned of this feature a few weeks ago with an AE cache error. It filled up my whole SSD with a cache of a project with a lot of element. Thanks for the intel! Yeah, since SSDs are usually pretty small in storage space due to price, I may pick up a 3rd SSD for just caching once I upgrade my PC parts. Always very useful information to know! I make regular habits to clean, even audio programs like Sonar store similar cache files in the form of “wave picture cache” as they retain cache files to visualize the waveforms of the audio data. This data also gets stored in a global folder (not with the project data) and has to manually be flushed. Working in Premiere with various video file formats such as Canon DSLR .mov files Premiere can at least be set up to store the media cache files it generates next to the media files themselves (meaning in the project folder or resources’ location of import). Working on a 28 day collab project called The RPM Challenge (an online music community challenge) we not only started writing and composing a full album from scratch but did the album photography, album artwork design, editing mixing and mastering and publishing, and we (my partner and I) documented as much of our efforts across the 28 days as humanly possible WHILE working on the project! Something close to 768 gB of video footage alone, added up to something like 1.2 TB after all the media cache had been generated!!! Needless to say we broke down the footage and project files into 4 episodes (weeks) to minimize the hard drive real-estate for the projects to roll, and once the first episode was cut, all the media cache files were manually deleted. Thanks for reminding me about After Effects media cache! Each app can be set to use different locations from one another to help minimize or easily separate the cache database files from being purged together by accident when you may want to keep some around. Dang that’s a lot of files buddy. Glad I could help! On my Mac Pro at work, I have at 7200rpm 2 TB SATA setup as my Disk Cache drive. I’m allowing it to write 500gb of space since I really don’t use that drive for anything else. At home, I have a 7200rpm 1 TB SATA drive on my Mac Pro and I allow only 100gb to the the Disk Cache. I’d like to get a pair of SSD’s for this machine since it’s an older rig but am going to have to hold off for a bit on that. Hi Joe. Why are you restricting the size of your cache files to 10-25% of the total size of your cache disk? I have an idea as to why but I am interested to hear your reason. My cache drive is 1Tb and I allowed 900 GB into the cache. Recently RAM previews have been going a LOT slower…PAINFULLY slower…so I am guessing it’s because my cache is nearly full. I could be wrong, but I don’t think disk storage effects the throughput of the drive unless you’re using 900GB of files at once. I would assume he sets it to 10-25% just for the mere fact of keeping the cache size low and manageable, or perhaps he’s saving the remaining for other caches from other applications such as C4D simulations, etc. Disk space usage does affect throughput (not on SSD). The closer to the beginning of the drive your data is, the faster the hard drive can read/write it. If cache is the only thing on the drive then the older data, probably not used anymore is on the fastest part of the drive and the data that is in use on the current project is on the slowest. Also, if he is at his limit then every time AE wants to create a new cache it has to first delete some old data. That delete will take time and slow down the initial cache write. Wow, didn’t know that. Good thing I’m on an SSD. Thanks for the info! Bingo! I didn’t see these comments until just now. I’ve since moved on to a different setup. Currently using the internal SSD on my 5K iMac and a 4TB USB 3.0 HDD stores all of my projects. I’ll soon be getting an external thunderbolt SSD to use as my cache disk to help keep the system drive clean at all times. Just to make sure, this definitely won’t affect any of the projects/original media? All the cache is doing is making it easier for After Effects to reference? Will new caches be recreated when I go back into projects? Correct, it won’t delete any media or anything except the project cache that makes re-rendering stuff faster. If you delete the cache and go back into the project, it’ll just create new cache. I think caches should be explained to all new after effects users before they even open AE for the first time. All the beginner tutorials start by giving a tour of the program and how to do this and that, and months of training go by and you have no idea why your brand new computer is getting slower and slower, and if you’re a new user, caches does not sound very familiar. Great post, cheers. Guilherme,..I 100% AGREE!!!! I mean it happened to me immediately after playing with AE for the first time. The next few days, I soon was going crazy trying to figure out where my HDD space was vanishing to!!! Although I’m happy that Adobe allows for us to click a button to remove it, it seems to be a secret; a very stupid secret. Also wish they offered a dialogue prompt that pops up when closing the program down for the day that simply asks, “would you like to clear the cache’ upon closing?” and then you simply click yes and it does this automatically before it closes. Just saying,…I think it would be nice. Or a setting that allows the user to select “clear media cache upon closing of program” . It still needs to be an option as there may be times when you don’t want it cleared until you are completely done with a project ( days, weeks or months later). I´ve tested a 126GB SSD drive for the AE cache and love it. BUT: is there a way to write a startup script, that calls the empty cache drive option in the ae pref? Everytime I start AE it tells me that the cache drive is full. Ah, I believe this can be done with scripting and I can probably script it. Let me look into it. Just cleaned about 45gbs. I also just found out about WinDirStat for PCs. Great tool for cleaning! 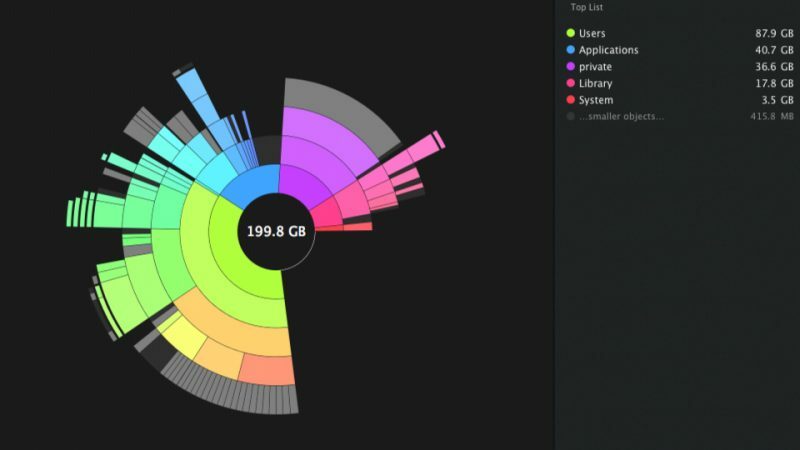 I also use a mac and I’m wondering what app you use visualize your hard drive usage. I use DaisyDisk on Mac, it’s awesome! What about if the clean disk cache is greyed out??? Means you probably disabled disk cache, OR you don’t currently have any disk cache. That was really helpful and clearly explained. 150GB of storage regained. Thank you. Glad it helped you reclaim 150GB! Thanks for this, just found 90 gb of AE files in my library. Thanks for the article. I checked mine out, and did not have more than 1g or so. I regularly use CCleaner to remove temporary files in between projects and after using this method to check, I’m glad that works like a charm. I Have quick question will it delete my files on My drive or does it only have to do with AE? It will delete the cache off the hard drive of course to free up space, but it’s not going to delete any project files or assets, etc. 80.4 GB cleared and approaching a rather tight deadline. Thanks so much! Glad you were able to free up all the junk! Thank you so much. I had 225 GB of Cache between 3 versions of AE. That was a lot of space. Thanks again. hi there, I’ve written a little tool, to delete the Cache. You can choose what kind of cache should b deleted. Otherwise you can empty all caches folders at one click. http://incite-medienproduktion.de/CacheCleaner/ have fun. if you have multiple fast drives available – would you use the fastest drive for footage, or the disk cache? I’d say put your fastest as the drive for footage so programs won’t have a hard time constantly reading the data. Glad you were able to clear up space! I am working for a video Production company. Doesn’t it feel great to remove 250GB instantly haha. Decided to take a tiny break from it since the engagement seemed to slow down as I kept throwing new ones up! Will probably come back February! Looking forward to your awesome entries Lage. Thanks for this man. I really need to buy an SSD now. It makes a huge difference. I was using an external 4TB USB 3.0 HDD as my cache drive, thinking it was “good enough”. Wrong! Switched it to my internal SSD (gave it only 30gb space) and I saw a huge performance increase off the bat. It does mean I need to be vigilant of my disk space since SSD’s require no less than 10% of free space to run well but I guess just going in and clearing my cache every so often is worth the trade off for performance. A measly 25GB. Thanks for the article! very helpful. I am using a external drive instead of my C drive!!! This is just straight up neglect on adobes part. Why doesn’t the cache automatically clear on low disk space like every other sane program? Can you delete your cache while rendering? Can you disable it while rendering? I feel the disk cache isn’t doing me any good, but I don’t want to start over. I’m two days into the estimated week-long render. It was good. About 23GB. Not that much but saved me space for other app installations or various files. Thanks! 55.6GB here. I’m on a Mac, and I keep my Status Bar in an open Finder window showing (⌘/ toggles it off and on) and know to its time to clear my cache when I get down to say, 128GB after doing some video editing in After Effects. So clearing your Media Disc Cache will give you more space but will it delete your entire project if it isn’t finished? or just the previews of that project? Can somebody clarify because I don’t wanna clear it and have my entire project be deleted. I have a problem, I can’t delete my cache https://uploads.disquscdn.com/images/7336d8e7b50663a3e5cd6cd96426d225db2d0fa0531d0c4a2e53eb6b97e1452e.png since the button is greyed out! HELP! Empty like 100 GB. Thanks! I had 682GB piled up! Is that a record? Saved by the bell 22.5 GB Cleared! Thanks! saved 100gb because after effect,, thanks ??? ?